UWM in partnership with Disaster Management Cell of MCGM organized first responder trainings for Ganesh Mandal of city. The training covered the aspect of flood (causes and preventive measures), fire safety, bomb threats, crowd management and first aid methods. In all 100 representatives from various Ganesh Mandals successfully completed the training. The training was imparted by the trainers from MCGM's Disaster Management Cell. Ganesh festival is one of the biggest festivals in Mumbai city and popularity of the same cuts across boundaries of age and religion. Given the popularity of the festival, high footfall at various pandals and immersions sites are witnessed. 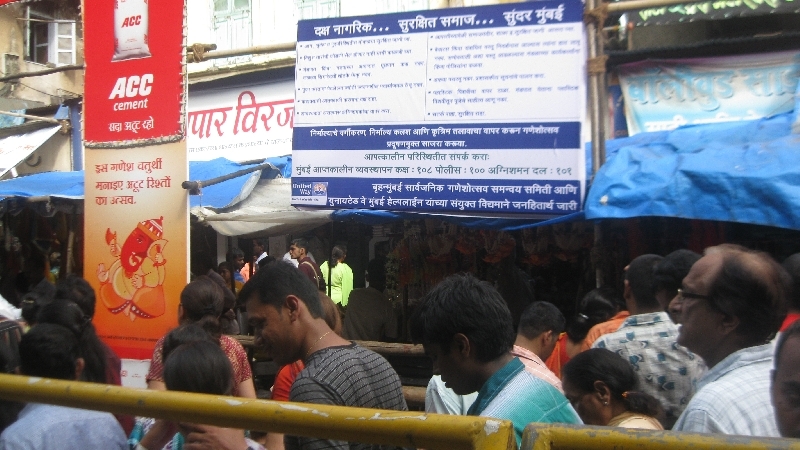 Such gatherings are vulnerable to incidents such as overcrowding, stampede, casualties to the devotees, fire occurrences at the Pandals, to tackle such situations it is imperative to educate the visitors to these pandals and make them aware of the Do's & Don'ts to be followed during different disasters such as fire, drowning stampede and other related emergencies. For this, UWM partnered with the Bruhanmumbai Sarvajanik Ganeshotsav Samanvay Samiti, which is the city wide federation of all Ganesh Pandals in Mumbai and has been formed in collaboration with MCGM. This committee facilitates coordination among all the Ganesh Mandals for smooth functioning of various activities including compliance with MCGM's rules & regulations during the festival celebration, management of immersion sites in the city, etc. Informative banners were put up at 200 major Ganesh Pandals of the city which displayed vital information regarding different disasters, Do's and Dont's and emergency contact numbers in times of crisis. 50 student volunteers from Valia College, Kamla Mehta and Kirti College played key role in reaching out 200 Ganesh Pandals and distributing informative banners to all these Ganesh Pandals. Ganesh festival is important social event not only in terms of safety but also cleanliness. It generates Nirmalya (Holy waste including flowers leaves etc.). As a part of the festival, Ganesh Idols and Nirmalya are immersed into the water. Nirmalya immersion creates water pollution and destroys aesthetic beauty of beaches. UWM mobilized over 110 student volunteers from Valia College, Kamla Mehta, Kirti College and Sydenham College of Commerce and Economics to carry out post immersion Clean-Up drives post the 7th and 11th days of the immersion at Juhu Beach and at Shyamnagar Lake in Jogeshwari East in Partnership with K West Municipal Corporation of Greater Mumbai and K East Municipal Corporation of Greater Mumbai. This involved Clean-Up drives all along the seashore, and one- on-one interaction with visitors on the beach to sensitize them on the importance of adopting eco-friendly measures for maintaining cleanliness on the beach. The volunteers joined hands with the municipal officials and helped them extensively in clearing away the holy waste and the idols that had cluttered the seashore.